Immigrants who want to become US citizens face barriers from the high cost of the naturalization application, according to a new Stanford study. The work suggests that lowering the federal application fees or creating local programs to provide financial assistance to cover them, could help more people gain the benefits of citizenship, including the right to vote and participate in democracy. The findings came from studying low-income immigrants in New York who registered for a lottery to receive vouchers that cover the fee to apply for US citizenship, which is now $725. The research team, led by Stanford's Immigration Policy Lab (IPL), partnered with the New York State Office for New Americans and two foundations, Robin Hood and the New York Community Trust, to develop a first-of-its-kind public-private naturalization program calledNaturalizeNY. The program was launched in 2016 by New York Governor Andrew Cuomo. Editor's Note: Last iteration of NaturalizeNY program news: "Naturalize New York is now closed." The researchers showed that naturalization application rates jumped by 41 percent among the immigrants who got the vouchers compared to those who did not. "This study provides critical evidence that high fees are an important barrier to citizenship for low-income immigrants," said Jens Hainmueller, a professor of political science at Stanford and a lead author on the research paper, published Jan. 15 in the Proceedings of the National Academy of Sciences. "More importantly, IPL has co-developed a program model to address this barrier, a solution that can be rolled out in communities across the country." Based on their findings, the researchers suggest increasing naturalization by introducing a multi-tiered fee structure in which wealthier applicants pay higher fees. They also encourage local communities to establish public-private funding to support low-income immigrants in paying for naturalization fees. Naturalization provides immigrants with virtually the same rights and benefits as native-born citizens, including the right to vote, access to federal jobs and protection from deportation. A recent report from the National Academy of Sciences found that having more naturalized immigrants is good for the national income and increases political participation and integration of those immigrants within American society. Surveys show that most US immigrants want to become citizens. But compared to other similar countries, like the United Kingdom, Canada and Australia, the United States has a lower naturalization rate, which has been decreasing over recent decades. In 1970, 64 percent of legal foreign-born residents had become citizens, and that proportion dropped to 56 percent in 2011. At the same time, the naturalization application fee has increased from $35 (or $80.25 in 2017 dollars) in 1985 to $725 in 2017. Previous research on barriers to naturalization relied on data from censuses and surveys and focused on individual characteristics of the immigrants, such as language skills, resources and country of origin. This new study provides the first causal data to reveal the magnitude of the financial barrier immigrants face, while also providing a model approach for communities to help low-income immigrants naturalize. The Immigration Policy Lab conducts workshops with government agencies and immigration service providers to create a research agenda that spurs policy innovation. "The initial idea of providing financial assistance for application fees to low-income immigrants struck us as an exciting opportunity, and through a collaborative effort, we were able to create an innovative statewide program coupled with rigorous evaluation," said Duncan Lawrence, executive director of the Immigration Policy Lab and a co-author of the study. 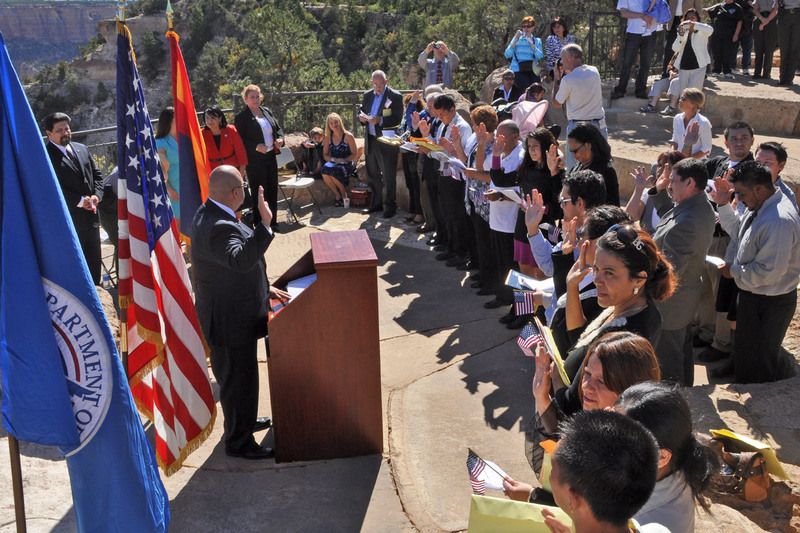 As a result of the program's lottery, 336 immigrants received fee vouchers while 527 did not. The vouchers roughly doubled the naturalization application rate, from 37 percent among those without a voucher to 78 percent among recipients. Of people who applied for the lottery, 1,760 immigrants were identified as likely to be eligible for a federal fee waiver and were notified of the federal program. The researchers then randomly encouraged groups of registrants to apply for the waiver — with emails, phone calls, letters and even a $10 metro card to cover transportation costs. But none of that additional encouragement increased application rates. "It’s clear that we have more to learn about what sorts of cost-effective nudges may or may not work," Lawrence said. "Raising awareness of the fee waiver itself may be an important piece of the puzzle." The group hopes to continue studying the barriers low-income immigrants face in applying for citizenship. They will also track the lives of the immigrants who naturalized as a result of the program and those who did not. "Ultimately we want to look at how naturalization affects the lives of immigrants and communities," said Michael Hotard, a study co-author and IPL program manager who coordinates the multi-year study.